Up until now, performance management has assumed the context of a classic hierarchical organisational structure, where leaders manage subordinates. 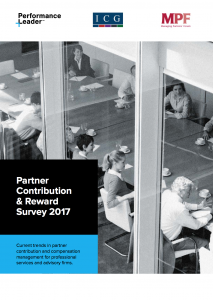 As the ‘Partner Contribution and Reward Survey 2017’ shows, managing performance within the unique dynamics, politics and structure of a professional services firm’s Partner group requires a different approach and skillset. We believe, at a higher level, that Partner groups need to reframe their perspective of performance management. For individual Partners, it is clear that a lack of performance management, and the learning and development opportunities that might result from reviews, negatively impact their ability to achieve their potential. Scaled up across the Partner group, the repercussions on the future growth prospects of the whole firm, in a world of greater competition, market entrants and disruptive technologies, are potentially catastrophic. A key problem within many firms is that ‘performance management’ is almost always approached from a defensive point of view – “Don’t question my position” – rather than as an opportunity to outline areas that could be developed or improved. ‘Performance management’ has connotations of being ‘judged’ or ‘assessed’ and therefore is bound to create emotional fallout. The top performing firms measure and reward additional behaviours beyond simply utilisation and hours billed. Metrics that focus on the past and are based on short-term results will yield corresponding performance from Partners. We suggest performance management conversations should instead be based on broader metrics and multiple inputs that reward and recognise the behaviours you want to see demonstrated and developed by the Partner group, including: client, staff and peer feedback, brand development, people development, collaboration efforts, client relationship building, client service, innovation, pro-bono commitment, thought leadership generation and public speaking. How firms choose to measure and reward these behaviours will require some innovative thinking. We strongly support the recommendations in the Partner Contribution and Reward Survey 2017 that Partners move beyond occasional, friendly, impromptu fireside chats to regular informal coaching conversations that provide a mix of support and challenge. To achieve this ambition will require a development of the requisite peer-to-peer advanced coaching skills. For Partners to undertake potentially difficult and emotive performance management conversations, while safely navigating the unique politics and leadership dynamics of the wider Partner group (such as extensive individual autonomy and contingent management authority) a high level of emotional intelligence will be required. It’s time for professional services firms to give these skills the priority they deserve and ensure they are developed within their workforce throughout a career. There needs to be a recognition among the Partner group that there is nothing ‘soft’ about soft skills. In many firms surveyed, Managing Partners retain responsibility for performance reviews. One option for firms to consider is to use employees from outside the Partner group to carry out performance management and coaching. This would remove much of the politics and emotion involved in a peer-to-peer conversation while retaining objectivity. As Prof. Laura Empson suggests, HR departments are still dismissed as “functionaries”’ enacting the instructions of the Partnership. For HR to become involved in any performance management conversations will require Partners to change their attitude towards HR, which will only happen if HR personnel can prove their strategic worth beyond simply acting as an admin function. Is the definition of Partner "No more development required"?